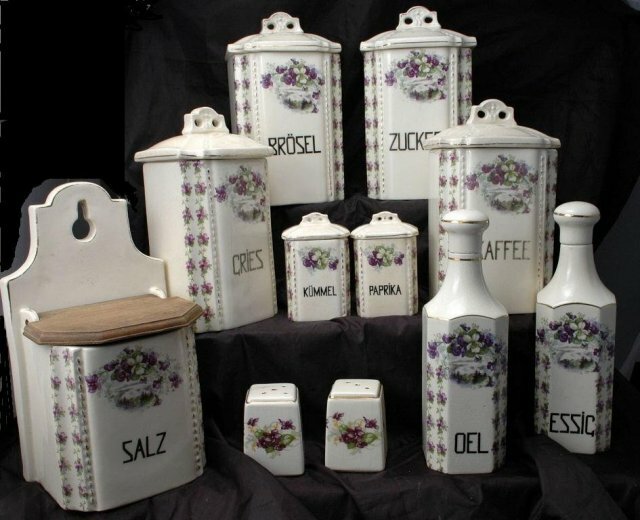 Old German Porcelain 11 Piece Canister Set decorated with Purple Violets Gold Trim and raised beading. The set includes a wall mount salt box, two bottles, 4 large canisters, two spice jars and a salt pepper shaker set. The larger containers measures 8.75" tall x 5.5" wide x 2.75" deep. The spice jars are 4" x 2" x 2.75" These measurement include the lids. The salt box is 10.5" x .5.5" x 4.25". It has a hinged wooded lid. The salt & pepper shakers are 2.75" wide x 2"tall and are missing the stoppers. The shakers are not original to this set but are well matched so I am including them in this lot. The shakers have crazing. The rest of them are embossed with "Grell" on the bottom. The condition is nearly excellent. There are a few very minor flaws here and there. Some of the color has faded on a few pieces. The inside rim on one canister is a shallow crack that does not go through to the outside. 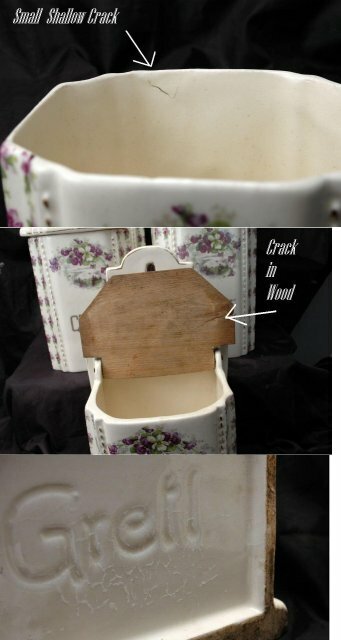 The salt box lid has a crack in the wood and there is a crazing on the bottom. There maybe a rough edge on a few but overall the condition is remarkable for age. 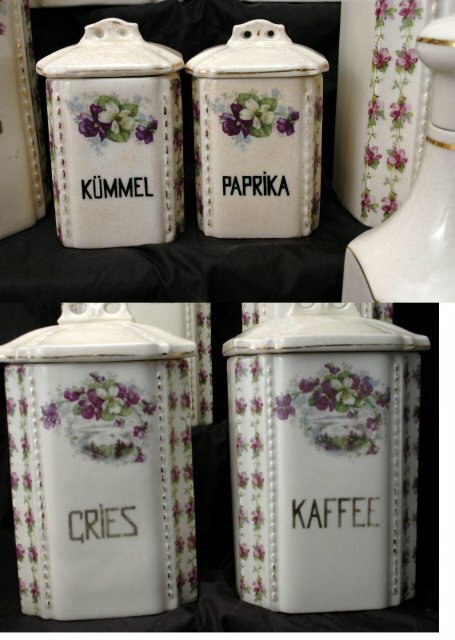 Items Similar To "11 Pc Canister Set Purple Violets with Salt Box Old German Porcel..."